Your favorite jogging path might not resemble a runway, but that doesn't mean fashion can't improve function in your workout. What you wear when you're jogging can help you prevent injury, minimize discomfort and work out more effectively if you choose wisely. You'll get hot and sweaty during jogging, so breathable fabrics -- such as cotton/polyester or cotton/Spandex blends -- are essential. If you're shopping for new jogging clothes, consider investing in tops and bottoms made with fabrics that are designed to wick moisture away from your skin. Though you don't want skin-tight running clothes, which could cause skin irritation, very baggy clothes can slow you down slightly -- a factor to consider if you're keeping track of your workout time. Also keep in mind that jogging increases your body temperature by as much as 15 degrees, so wear layers that you can remove if you start to feel warm. In hot weather, add sunglasses to your ensemble -- wraparounds designed to block UVA and UVB rays will give you the best protection. A lightweight, foldable hat you can easily stash in the waistband of your running shorts helps fight the glare. When it's cold, stay warm by wearing a lightweight fleece hat, vest and gloves. If your cold weather comes with snow and sleet, opt for water-resistant pants and shoes. Dressing in three layers is ideal -- the outer layer protects from wetness, the middle layer keeps you warm and the layer closest to your body should be comfortable and breathable. For women joggers, a good sports bra is essential for comfort and to prevent saggy, droopy breasts down the road, says Joanna Scurr,a biomechanist at the University of Portsmouth in the United Kingdom, in "Fitness" magazine. If your chest is smaller -- an A or B cup -- a shelf-style bra works well, but if your chest is bigger than a B cup, you'll want a bra with individual cups. Whatever your chest size, you'll get the best support with wide straps and racerback styling. Comfortable shoes with plenty of support are essential for jogging. If you're shopping for a new pair, it's smart to visit a store that specializes in running shoes. Bring your old running shoes with you, and ask the fitter to help you analyze your stride and pronation to find the right fit. If you run on well-tended paths, standard jogging shoes are fine, but if you like to hit the trail when you run, consider trying trail-runners, which are sturdier and have more traction on the bottom to protect your feet. 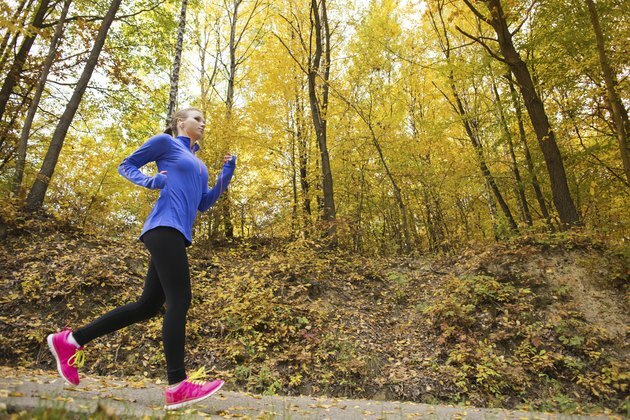 What Do You Wear to Run If It's 40 Degrees? What Should Women Wear to the Gym?